The Planetarium was opened on November 16, 1988. It contains a Spitz Space Voyager projection system under a 20.6 meter (67.5 feet) dome that is tilted at an angle of 27 degrees. 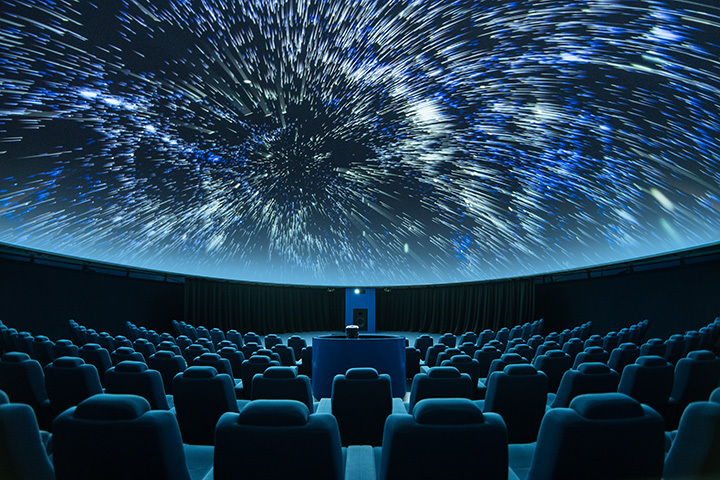 At the present time, the Hummel Planetarium is one of the largest and most sophisticated Planetariums in the United States, especially on a university campus. The Planetarium has seating for 164 people in very comfortable and generously sized seats. The projection equipment used to simulate the night sky consists of a star ball that measures one meter in diameter and is capable of projecting up to 10,164 stars. Other equipment includes five planet projectors, a sun projector, and two image projectors that are used to project the moon or a variety of other objects both natural and man-made. When all projectors are operated simultaneously, a sky can be created as seen from any point on earth, anytime during the day or night, up to 100,000 years in the past or future. A special feature of the Space Voyager projection system is its ability to not only show you the sky as seen from earth, but also from any point within 100 astronomical units (9,300,000,000 miles) of the Earth. This makes it possible to see the sky as it would appear from any planet or moon within our solar system, or any point in between. A separate computer system allows the control of hundreds of special effects projectors such as slew projectors that project objects that move with the star field, a video projector on a pan/tilt mount, dozens of slide projectors, three panorama systems, and dozens of special effects projectors to simulate such things as comets, meteors, asteroids, eclipses, and much more.